Located in Greenwich Village, The Jane Hotel is adjacent to Whitney Museum of American Art and within a 10-minute walk of other popular attractions like The High Line Park. This 208-room hotel welcomes guests with conveniences like a restaurant, a bar/lounge, and free in-room WiFi. Enjoy a leisurely bite to eat at the onsite restaurant, or have a drink at the bar/lounge. For your convenience, breakfast is available for a fee. A flat-screen TV comes with cable channels and a DVD player, and guests can stay connected with free WiFi. Beds sport premium bedding and the bathroom offers free toiletries and slippers. Other standard amenities include an iPod dock, free bottled water, and a ceiling fan. Guests staying at The Jane Hotel enjoy free WiFi in public areas, free use of bicycles, and a porter/bellhop. The front desk has multilingual staff on hand 24/7 to help with tours or tickets, luggage storage, and securing valuables. Guests enter The Jane Hotel and find themselves in a lobby that mixes old-school hotel decor with eclectic modern touches. Columns and boldly colored walls frame a space filled with plush couches, animal prints, chandeliers, and candles. The hotel has a concierge desk and offers property-wide complimentary wireless Internet access. Bicycles are complimentary for guest use. Parking is available in area garages for a surcharge. 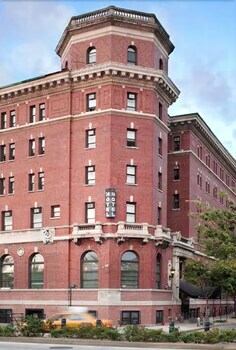 The Jane Hotel offers 208 air-conditioned accommodations with iPod docking stations and DVD players. Beds feature premium bedding. Flat-screen televisions come with cable channels. Bathrooms include bathrobes, slippers, and complimentary toiletries. Guests can surf the web using the complimentary wireless Internet access. Business-friendly amenities include laptop-compatible safes and phones. Additionally, rooms include complimentary bottled water and irons/ironing boards. Housekeeping is offered daily and hypo-allergenic bedding can be requested. Old Rose - Opening hours 7 AM to midnight Sunday through Wednesday; 7 AM to 2 AM Thursday to Saturday. Old Rose is a cafe, restaurant, and bar located on the first floor, overlooking the Hudson River. Open for breakfast, lunch, dinner, and late-night dining, the menu emphasizes seasonal Italian fare using local produce, and features a small selection of raw seafood and pizza. The beverage menu consists of local craft beers on tap, natural wines, and specialty cocktails. The Jane Hotel provides complimentary bicycle rentals.